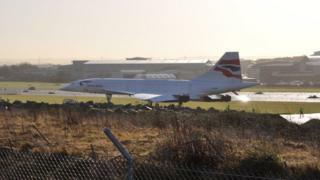 The last Concorde to take to the skies made its first journey in more than ten years - when it was towed into a new hangar. Concorde 216 has been parked on a runway in Filton, Bristol, since its farewell flight over the city in 2003. A small crowd gathered to watch the jet make its latest journey - although the sound barrier remained unbroken during its 800m (2,642ft) trip. It took about 20 minutes to complete the move to its new home. Latest on this and other stories in the West of England. The Concorde is to be the centrepiece of the Bristol Aerospace Centre, due to open this summer. The £16m museum - built around a listed WW1 hangar - will also document the city's central role in the development of the modern aviation industry.